Welcome to 2018! What are your new goals for this year? My number one goal is to try harder. I know that may sound funny but I want to put forth more effort into everything. My marriage, my parenting, my work, and just life in general. I already try hard at everything I do. I can only imagine what I can accomplish and succeed in if I try harder. With our marriage. one thing that I think we have gotten comfortable with is each other. We want to spice it up a little by being more adventurous. So we are. We used the extended holiday break and the points we earned from our summer traveling to our advantage. We had enough points to take a whole weekend out and only had to pay for half of one night! Packing was super easy. 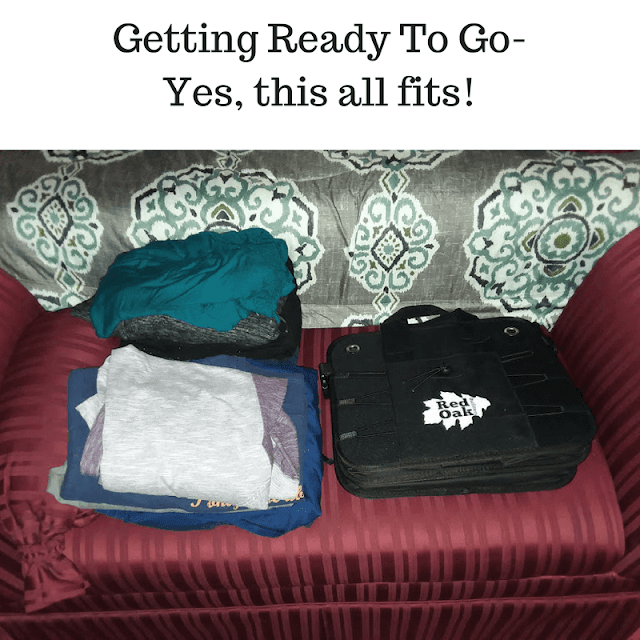 I got a trunk organizer from Red Oak Outfitters. It's a collapsable 2 compartment container that has 10 exterior pockets. That's plenty of storage for our 2 overnights. The best part is it folds up super slim when we aren't using it. As far as it is portable, it has two handles and it's very sturdy. The pockets are great for our toiletries and cords. With this trunk organizer, there is no need for packing luggage or hanging bags. 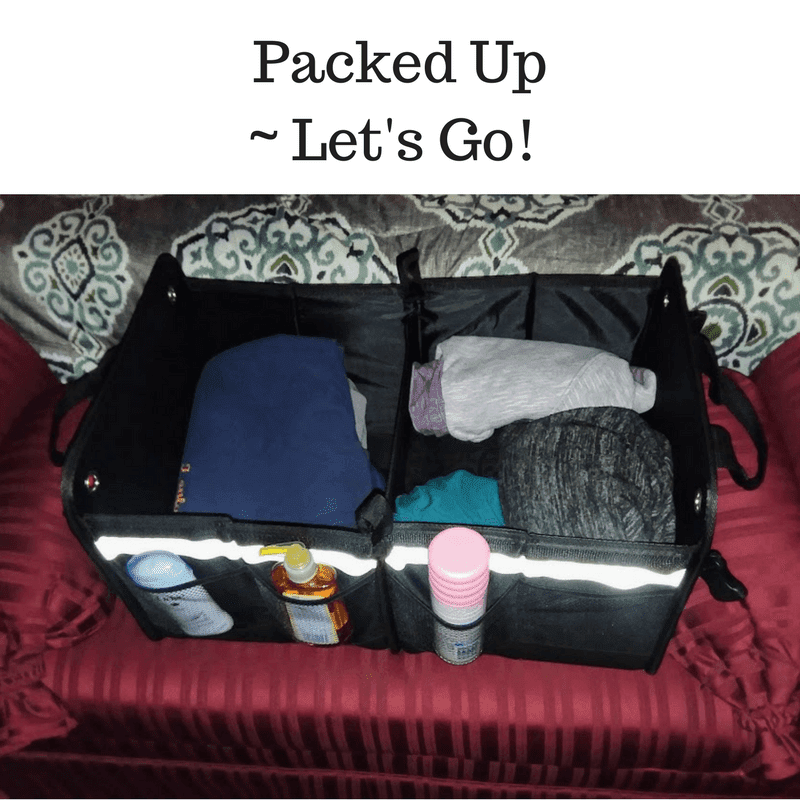 We packed what we needed and it was so easy! We decided to do the fun stuff that we don't do when the kids are with us. For the most part, we did NOTHING. We got a cute romantic room with a jacuzzi. With all of the excitement of making plans and it actually working out, getting into town, checking in, and unpacking our stuff, we were both tired by 8pm. That's real life guys. Without the hustle and bustle of the kids, house chores, and everything else, there is actually time to be tired and embrace it! Our first night was all about the chill time! We went to a local restaurant, Brothers, that we love to go to. It's a great place for family or intimate dining. In case you are looking for suggestions, everything is delicious. We had the Mozzarella sticks for an appetizer and I had the Brothers Smothered Chicken. It was more than I could eat at once. I had the rest for lunch today. After we came back to our room, we watched movies on tv and talked about stuff. Nothing extraordinary. No life event planning or anything like that just full conversations that weren't interrupted by breaking up kid fights and negotiating over homework and chores. I love the beautiful disaster of our home life but mom and dad time was definitely something we needed. The second day, today, we decided we wanted a different room since Aron's hand is hurt. We can't use the jacuzzi after all. Our cat bit Aron's hand and it's swollen pretty bad. We thought a suite would be better and we were right. We have a dining table for two, a couch, and a king-sized bed. We have been hanging out on the couch since we came in. We made plans to go do other stuff today like going out to the movies and a nice lunch and dinner. Well, this room is so cozy and our leftovers were so awesome, we might decide to go out later on. It's after lunch and we are both dressed and ready but this quiet cozy time is better than anything going on in this 9-degree weather. I will come back in a while to update what we do later. This is awesome guys. A mini staycation is exactly what we needed to set the tone for our magic 10 years!! Our adventure took us to one of the local tattoo shops. Matching tattoo's- almost. We took a line from one of our favorite songs and had them put on. This trunk organizer is even awesome for shopping. I can bring it to the store with me and as the groceries are scanned, they can go right into my collapsible container and right into the trunk then right into the house. There is no need for all of those plastic bags that I cram into each other, hang on my kitchen window and never actually use. We love this organizer. It's perfect for all of our adventures!